Whether it’s whales, seals or manatees, seeing them from the shore is the Holy Grail of wildlife watching. It’s easy. It’s (usually) free or cheap. It’s family friendly. And, most important to marine biologists, it doesn’t bother the animals at all. This area had so much trouble with manatee harassment the wildlife refuge set up emergency rules in the fall for Crystal River. But seeing manatees from the shore in the Homosassa/Crystal River area of Florida, the manatee capital of the world, is still not that easy to do. Luckily there are a few other options elsewhere in Florida. 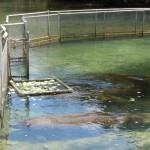 The Homosassa/Crystal River area hot springs draw hundreds of manatees every winter. But even though the area is overrun with tourists in February, there’s hardly any centralized information on where an how to see them. The towns are painfully lacking an obvious shore-based option, easily accessible to families with strollers, canes, non-swimmers, the over-weight or sun-sensitive, small kids, seniors, dogs or people in wheel chairs. Part of the charm of the area is that it hasn’t been hit by chain store America or the typical T-shirt shops that splatter coastal attractions. But, that doesn’t mean it’s all cutesy local. There’s an endless series of dollar stores, auto body shops and motorcycles. And there are few of the traveler’s infrastructure: no local coffee shop and not even a Starbucks or even Dunkin Donuts. The only local ice cream shop shut down in the middle of a holiday weekend because it was too stressful (though there is a DQ). The Bridge — There are actually two bridges over the Crystal River, though they are difficult to find. 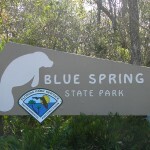 Off Route 19, follow signs to the Crystal River NWR or to the Dive Center of the Port Hotel and Marina. Neighbors don’t like it, but people park at the refuge or along the roads and walk to one of two bridges on SE and SW Kings Bay Drive. They cross the passage that leads to Three Sisters. You will have to go when it’s cold (late December to early February) to get a view from here. 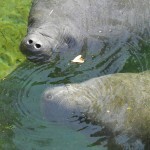 Homosassa Springs Wildlife State Park lets you see manatees visiting from the wild (late Dec.-early Feb.) and captive manatees that either can’t be released or are in temporary care. 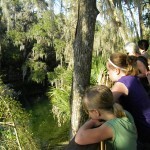 In the winter wild manatees come in the lagoon and you may see them from the shore. 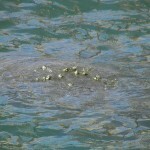 You can see a pen of nonreleaseable female manatees getting fed cabbage. Bonus species: red wolves, sandhill cranes, flamingos, key deer, whooping cranes, bald eagles, panther. Adults, $13; Kids $5. It opens at 9. We tried hiking into the Chassahowitzka NWR (via the Withalocooche State Forest Homosassa Tract off 19) and got nowhere near manatees or the shore, though we did cross a creek that in theory they could have visited. The refuge confirmed those were the two main spots. 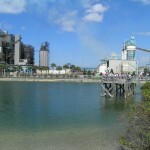 About an hour south in Tampa, you can see them just minutes off I-75 at the Tampa Electric Company’s Manatee Viewing Area. It’s a sweet set-up, with plenty of room on the platforms, bathrooms, food, exhibits and a trail. We went in mid-February and saw about 25, which I thought was pretty spectacular. One of the guides said there were “hardly any” compared to a week earlier when they had 300! 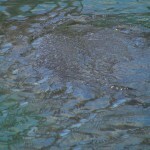 There are a couple other power plants around Florida where you can see manatees drawn by the warm run-off water. 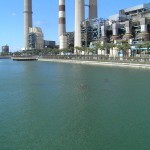 There’s a nuclear power plant right in Crystal River that draws manatees with its warm water. 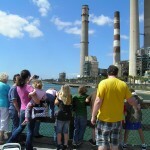 But Crystal Energy says that because it’s a nuclear plant security is too tight for manatee tourists. 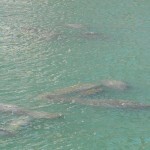 You can’t see the manatees there by land or sea. 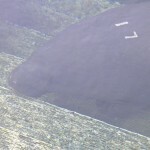 I looked them up on Google Maps and I’m pretty sure I see some manatees in the water from the aerial view. 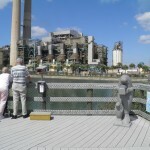 Tampa Electric Manatee Viewing Area Platform. Kids hanging dangerously on rail. Thanks for your comments. I updated the post to clarify that it’s the Crystal River NWR in Crystal River. I was under the wrong impression from the Chassahowitzka NWR Complex encompassed the Crystal River site. Working down there, I’m sure the distinction between the two NWRs is enormous, but to travelers from the rest of the country, where wildlife refuges are 100s of miles apart, it’s odd to think of two fantastic refuges so close. 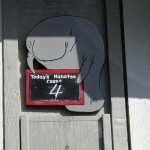 That’s why I just refer to the Homosassa/Crystal River area, because for visitors the whole thing is the manatee capital. I also updated how we came to hike in Chassahowitzka NWR–via the Withlacoochee State Forest Homosassa tract. It’s the only hiking trail I found off Route 19. At the end of their road, you end up on hiking trails in Chassahowitzka NWR. This information is very confusing and not accurate. 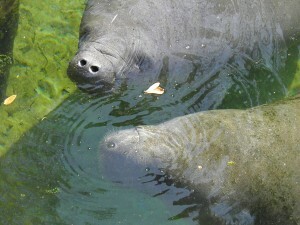 First you are talking about viewing manatees from the Homosassa area from land and then you give directions to view manatees in Crystal River. The signs for the refuge in Crystal River are to Crystal River NWR, not Chassahowitzka NWR which is located in Homosassa. You many view manatees from one of two bridges on Kings Bay Drive and 1st Ct. provided you don’t block traffic or park on private property. I’m not aware that our neighbors mind visitors parking in the refuge parking lot. The manatee emergency rule applies to Kings Bay in Crystal River, not the Homosassa River. I’m not sure where you went hiking into the Chassahowitzka NWR, but the refuge is boat-accessed only. Maybe you were in the Chassahowitzka WMA?? 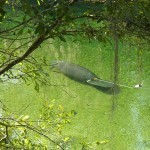 Chassahowitzka NWR is summer habitat for manatees. 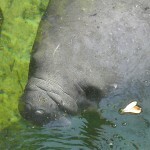 Please call the Chassahowitzka/Crystal River NWRs for manatee information at 352/563-2088.